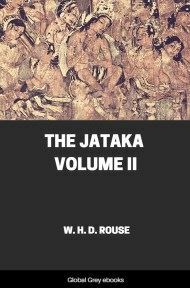 This is Volume II of The Jataka, a massive collection of Buddhist folklore about previous incarnations of the Buddha, both in human and animal form. Originally written in Pali, and dating to at least 380 BCE, the Jataka includes many stories which have traveled afar. 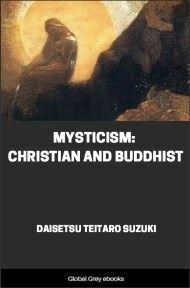 Many of these can be traced cross-culturally in the folklore of many countries. It is said that one day the king of Kosala had just passed sentence in a very difficult case involving moral wrong . After his meal, with hands not yet dry, he proceeded in his splendid chariot to visit the Master; and the king saluted him, his feet beautiful like the open lotus flower, and sat down aside. Then the Master addressed him in these words. "Why, my lord king, what brings you here at this time of day?" "Sir," said he, "I missed my time because I was sitting on a difficult case, involving moral wrong; now I have finished it, and eaten, and here I am, with my hands hardly dry, to wait upon you." "My lord king," replied the Master, "to judge a cause with justice and impartiality is the right thing; that is the way to heaven. Now when you first have the advice of a being all-wise like me, it is no wonder if you should judge your case fairly and justly; but the wonder is when kings have only had the advice of scholars who are not all-wise, and yet have decided fairly and justly, avoiding the Four Ways of Wickedness, and observing the Ten Royal Virtues, and after ruling justly have gone to swell the hosts of heaven." Then, at the king's request, he told a story of the olden time. Once upon a time, when Brahmadatta was king of Benares, the Bodhisatta was conceived by his Queen Consort; and the ceremonies proper to her state having been duly done , she was afterwards safely delivered. On his name-day, the name they gave him was Prince Brahmadatta. In course of time, he grew up, and at sixteen years went to Takkasilā for his education; where he mastered all branches of learning, and on his father's death he became king in his stead, and ruled with uprightness and all rectitude, administering justice with no regard had to his own will or whim. And as he ruled thus justly, his ministers on their part were also just; thus, while all things were justly done, there was none who brought a false suit into court. Presently all the bustle of suitors ceased within the precincts of the palace; all day long the ministers might sit on the bench, and go away without seeing a single suitor. The courts were deserted. 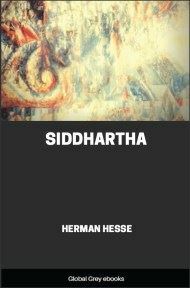 Then the Bodhisatta thought to himself, "Because of my just government not one suitor comes to try issue in court; the old hubbub is quiet; the courts of law are deserted. Now I must search whether I have any fault in me; which if I find, I will eschew it, and live a good life hereafter." From that time he tried continually to find some one who would tell him of a fault; but of all who were about him at court he could not find one such; nothing could he hear but good of himself. "Perhaps," thought he, "they are all so much afraid of me that they say no ill of me but only good," and so he went about to try those who were outside his walls. But with these it was just the same. Then he made inquisition of the citizens at large, and outside the city questioned those who belonged to the suburbs at the four city gates. Still there was none who had any fault to find; nothing but praises could he hear. Lastly, with intent to try the country side, he entrusted all government to his ministers, and mounted in his carriage, and taking only the driver with him, left the city in disguise. All the country he traversed, even to the frontier;  but not a faultfinder could he light upon; all he could hear was only his own praises. So back he turned from the marches, and set his face homewards again by the highroad. Now it fortuned that at this very time Mallika, the king of Kosala, had done the very same thing. He too was a just king, and he had been searching for his faults; but amongst those about him there was none who had any fault to find; and hearing nothing but praise, he had been making enquiry throughout all the country, and had but then arrived at that same spot. These two met, in a place where the carriage-road was deeply sunk between two banks, and there was no room for one carriage to pass another. Get your carriage out of the way!" said king Mallika's driver to the driver of the king of Benares. "No, no, driver," said he, "out of the way with yours! Know that in this carriage sits the great monarch Brahmadatta, lord of the kingdom of Benares!" "Not so, driver!" replied the other, "in this carriage sits the great king Mallika, lord of the realm of Kosala! It is for you to make way, and to give place to the carriage of our king!" Masters the good by goodness, and the bad with badness pays. Give place, give place, O driver! such are this monarch's ways!"